Your answer will display here. Can you pick up my child and take them to school? We do provide service to parent groups to pick up multiple children and take them to school; we do not pick up individual children and take them to the school of your choice. If you are interested in setting up a school run for your school, give us a call. Where can I get information about school run closures? All run closures are communicated via Facebook & Twitter, along with other relevant information – follow us to stay up to date with our status and news! Can you take my group to camp, skiing, to a local attraction? We can pick up your group at the location of your choice and take them almost anywhere. We go camping, skiing and most locations of your choosing. We do have some off road restrictions. Do I have to be a school group to book your bus? We work for anyone. We are popular with private sports groups, girl guides and boy scouts as well as many businesses. Does the bus have a washroom? Unfortunately our buses do not have a washroom facility of any kind. How many people can fit in the bus? Click here to go to our quote page, which features a passenger calculator. Is there storage for luggage? Does the bus have a radio? PA system? All of our buses have AM/FM stereos. Some of our buses do have PA systems. Should you need these services please make sure to request them at the time of booking. Why does a school bus not have seat belts? School buses do not have seat belts because they are built with compartmentalization. To learn more about compartmentalization, refer to this Transport Canada article. I want to drive a bus! What do I need to do? 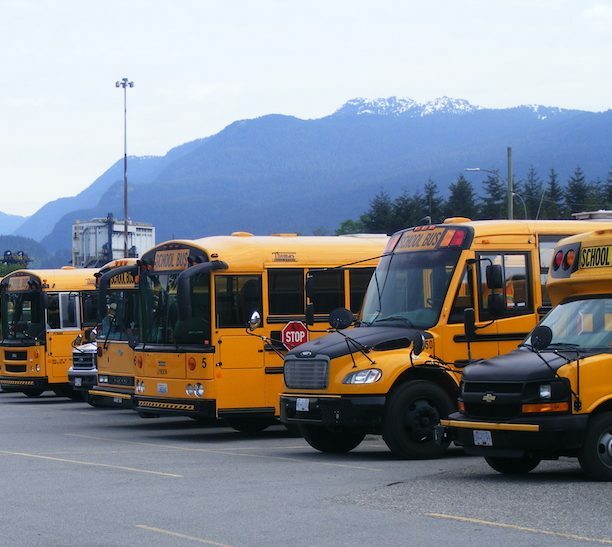 To drive a school bus an individual needs to have a valid, unrestricted class 4 or class 2 licence. Depending on the bus, you may also require an air brake endorsement. If you are interested in driving a school bus, give us a call or email us at resumes@lynchbuslines.com with your resume and abstract. What safety checks are performed on buses? Everyday a bus is inspected by the driver for deficiencies that need to be corrected before the bus can leave the depot (pre-trip). Another inspection is performed at the end of the day (post-trip). Buses are inspected by certified mechanics at regular service intervals, 10,000 kilometers or less, as well as at least one additional time (CVIP) as part of our preventative maintenance program. Buses are inspected again annually by the provincial government commercial vehicle safety enforcement officer (CVSE). Can I install a car seat? We have the UAS (Universal Anchorage System) installed in our new buses for car seats. If you need to have a UAS for your group please let our staff know when you book. For more information, please refer to this Transport Canada article on child seats. Can I contact someone after hours? For after hours emergencies you can contact us at 604-803-3500. We will be able to help you with your booking if it is before our next business day.